When it comes to whale watching, the Central Coast boasts an embarrassment of riches, especially along the Highway 1 Discovery Route. Here, whales, dolphins, sea otters, seals and seabirds play within full view of the shoreline. To make the most of wildlife viewing, the Whale Trail organization has identified the best whale watching spots on the West Coast. 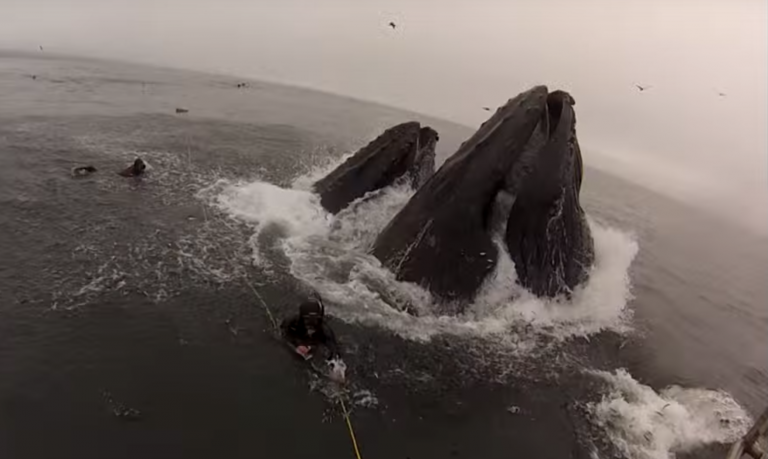 Of those 100 Whale Trail sites, San Luis Obispo County contains a whopping ten. (That’s the most in one county along the entire California coast!) Six of those whale watching viewpoints stand along the Highway 1 Discovery Route. Before embarking on your whale watching adventure, be sure to read our wildlife viewing tips. You’ll also learn how you can help preserve this special stretch of coastline even as you enjoy its beauty. When’s the best time for whale watching on Highway 1? This depends on what kind of whales you hope to see and where you hope to see them. Gray whales can usually be found migrating south from Alaska starting in October, then back again from mid-February to May. Less commonly seen blue whales (including humpbacks, fin, Bryde’s, sei, and Minke whales) migrate north during the summer, and visit the Central Coast annually for the summer krill bloom. Other species can be found at Whale Trail sites year-round, including common dolphins, California sea lions and sea otters. Like any excursion, whale watching is an adventure, so plan accordingly. Bring binoculars if you have them, as these will definitely equip you to see more offshore wildlife. As for clothing, do as the locals do and dress in layers. Weather on the Central Coast is generally very mild, but can be breezy. Don’t forget a hat, your camera or phone, sunscreen, water, and any pocket guide to whale watching you may own. Don’t forget to review our wildlife viewing tips before heading out. San Simeon has not one but two Whale Trail sites: in Old San Simeon and in the newer part of town. Both offer some of the best whale watching on the Central Coast. 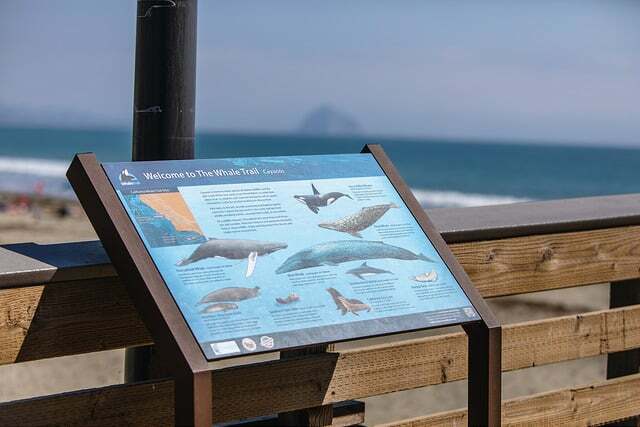 The Whale Trail sign stands at the San Simeon Bay Pier, overlooking William Randolph Hearst State Beach. To get there, head north on Highway 1 and turn left onto Slo San Simeon Road, just past the entrance to Hearst Castle. Find a spacious parking lot at the beach, and walk to the pier. Don’t forget to check out binoculars and guides for viewing San Simeon Bay Wildlife at the Coastal Discovery Center nearby. Gray whales, minke whales, harbor seals, California sea lions and sea otters can be spotted in these sites often. And occasionally? People have spied harbor porpoises, Pacific white-sided dolphins, humpback whales and even orcas. Catch sight of a gray whale headed south in October, then again traveling north between mid-February and May. Other species can be seen year-round, with summer months being the most active. Whale watching represents just one of the many fun activities available at Shamel Park in Cambria. The six-acre park offers access to Moonstone Beach and includes a seasonal swimming pool, children’s area, and picnic facilities. Take Highway 1 north to Windsor Boulevard, turn left and drive until you reach the park at the curve in the road. Commonly seen species include gray whales, Pacific white-sided dolphins, California sea lions, and sea otters. Sometimes, humpback whales, minke whales and harbor porpoises have also been seen. Gray whale southern migration starts in December and ends in February, while the northern migration occurs through March and April. Other species can be seen year-round. Very little beats whale watching in quaint, beachy Cayucos. The Whale Trail sign stands on the Cayucos Pier, originally built in 1872 by Captain James Cass, the town founder. Take Highway 1 South to North Ocean Avenue and make a right toward the beach. Turn right on Ocean Front Avenue and find parking along that street. Find the Cayucos Pier at 10 Ocean Front Avenue. Harbor seals, California sea lions, sea otters and humpback whales can be seen here, as well as the occasional orca and gray whale. Also, don’t miss sea urchins, anemones, crabs, starfish and more in the nearby tidepools! The best time to see gray whales is March and April, when mothers and calves swim closer to shore during migration. Watch for the acrobatics of humpback whales in spring and summer, as migration takes them south to feeding grounds. That species is known for its breaching, fin-slapping, and tail fluking. 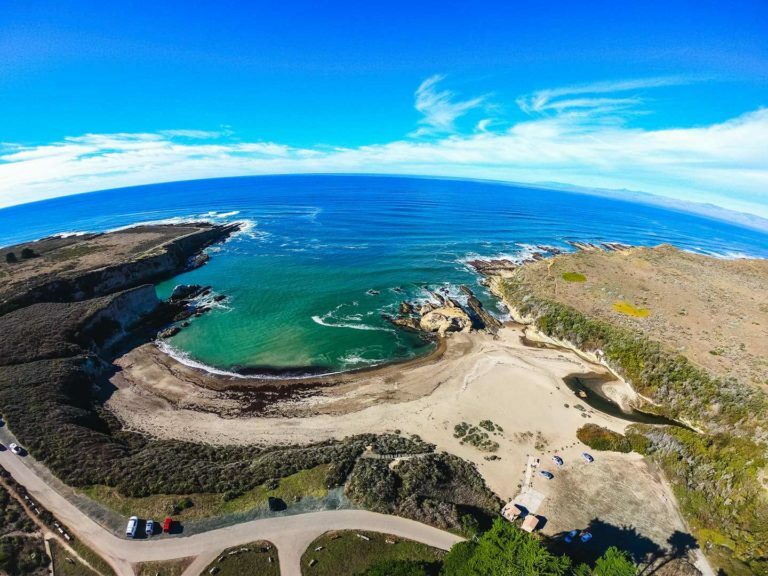 Make a day of exploring majestic Montaña de Oro State Park in Los Osos-Baywood Park, and include whale watching in your fun. Drive south on Highway 1 and take exit 277 toward Los Osos/Baywood Park. Turn right onto South Bay Boulevard and again, right on Los Osos Valley Road. This becomes Pecho Valley Road, which enters Montaña de Oro State Park. The Whale Trail sign stands at the south end of the park, north of Corrallina Cove. Reach the sign 1.65 miles into the Bluff Trail (trailhead near Spooner’s Cove). Gray whales, otters, seals, dolphins, seabirds and humpback whales can be seen here. The annual migration of gray whales brings them offshore from December through April. All other species can be seen year-round, but especially active in summer. 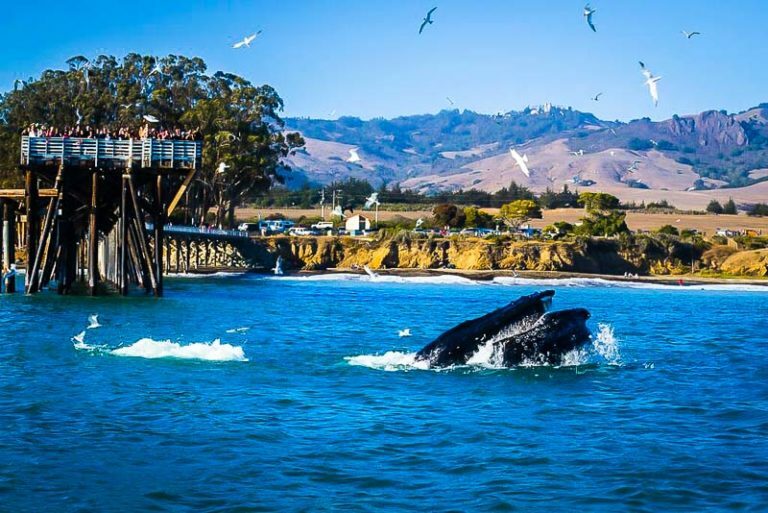 Whale watching can be pretty idyllic in picturesque Avila Beach. Make an afternoon of it by booking a patio table at a beachside restaurant, ordering a bottle of wine, and keeping your binoculars handy. The Whale Trail sign stands on the Avila Beach Pier. Drive south on Highway 101 and take exit 196 for San Luis Bay Dr toward See Canyon/Avila Beach. Turn right on San Luis Bay Drive and, at the intersection, turn right on Avila Beach Drive. Make a left on San Miguel Street and follow to the shoreline. Find parking in town, or in a parking lot and wander to the beach and pier. 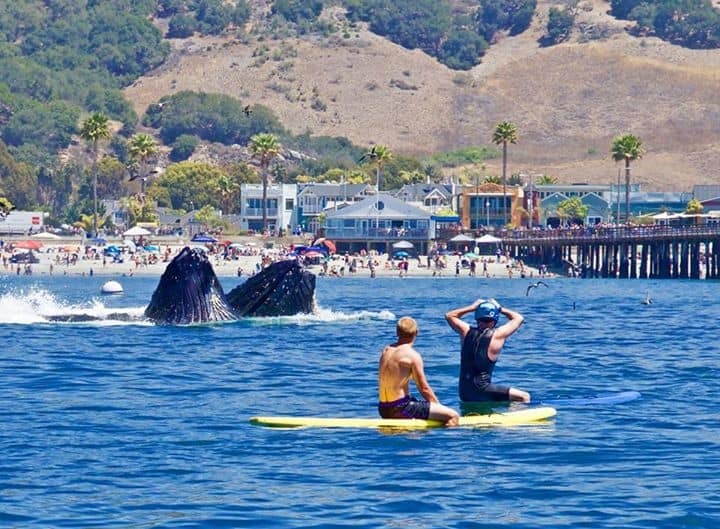 Gray whales and humpback whales feed in the protected waters of Avila Beach each year. Looking for more? Don’t miss dolphins, sea lions, and sea otters off Harford Pier, a working port further along Avila Beach Drive. Gray whales migrate past Avila Beach between December and April. Humpback whales are visible from shore year-round. The rugged California beach towns of Oceano and Nipomo sit at the end of one of the state’s largest dune complexes. 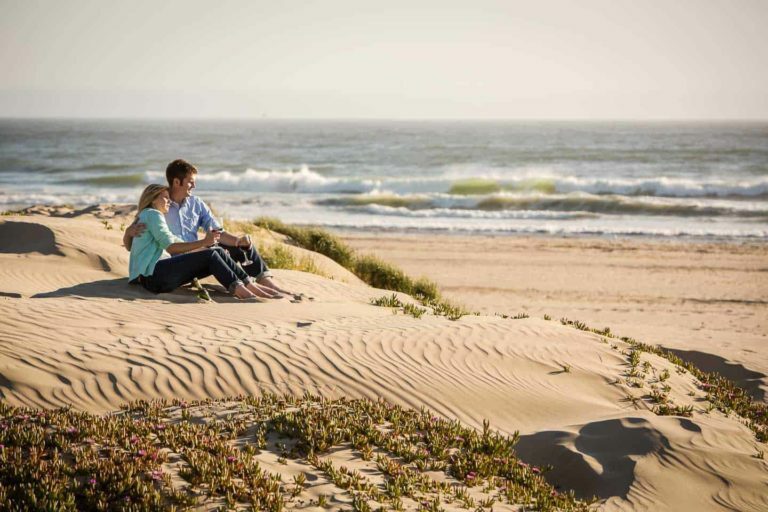 Watch the whales ― then watch visitors driving and horseback riding on the Oceano Dunes State Vehicular Recreation Area. The Whale Trail sign stands on the overlook to Pismo State Beach at West Grand Avenue (next to Fin’s Seafood parking lot). From Highway 101 South, take exit 191A for CA-1 S toward Pismo Beach/Wadsworth Ave. Continue on Highway 1/Dolliver Road for two miles. At the intersection of Grand Avenue, turn right and find parking where Grand Avenue terminates at the beach. Keep your eyes open for gray whale spouts, which resemble a heart shape. Also look for humpback whales, whose spouts are taller and shaped like a column. Find gray whales migrating between December and April, while humpbacks can be spied offshore throughout the year. Don’t miss this site’s plentiful seabird population, either! Find neighboring whale watching sites like Morro Bay for gray whales, humpback whales, Minke whales, and Risso’s Dolphins. (Turn west onto Yerba Buena from Highway 1. Turn right on Toro Lane and drive to the bluff.) Another great spot for whale watching is on the Pismo Beach Pier, overlooking Pismo State Beach from a different angle.